Of the novels I've reviewed in the last year, this is by far one of the most difficult. 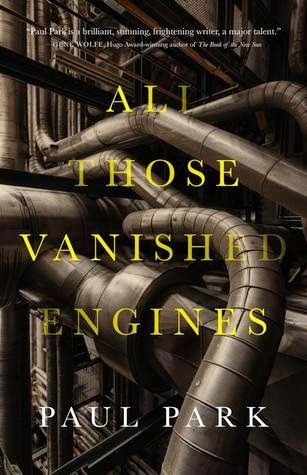 All Those Vanished Engines (2014) by Paul Park is not your typical SF novel. It is layered, divergent, and postmodern. If I were to describe this book in a single phrase, it would be "a destabilized metanarrative about art and history with mindscrew tendencies." Though I appreciate the ambitiousness of Park's narrative styling and prose, All Those Vanished Engines is a somewhat cold work. All Those Vanished Engines (ATVE) is essentially a collection of three novellas. The first is the most mystical of the bunch. Set during an alternate post-Civil War America, it follows Paulina as she attempts to make sense of her past by way of a fictional journal about a science fictional future. As the narrative progresses, however, the journal and the real world become increasingly closer to the same thing, destabilizing the reality with which the novel opens. Of the three narratives, this is by far the most compelling, not only because of its deliberate meta-ness, but also because of the way that meta-ness manipulates the actual reality of the text. The interaction between fiction and a fiction-within-a-fiction produces a chilling effect that is somewhat absent throughout the rest of the book, in no small part because this is the only section which seems dedicated to uprooting the reader's grasp on something "real." What became apparent as I continued reading, however, is that each individual section might have been better served as its own novel. The first narrative clearly connects to the second and third, but the first narrative's closing moments leave too much wide open -- too many questions unanswered. The second narrative is the first seemingly autobiographical section, drawing upon Park's actual writings to examine the writing practice (a supposed postmodernist trait) and a (initially) fictional account of a dying man's confessions about a secret project conducted during the Second World War (presumably some variation of the Manhattan Project, but with a distinctly 50s nuclear-monsters quality to it). Much of the section follows the narrator as he tutors another writer in the literary art, but it jumps between the narrator's personal relationships and his efforts to write a novel (Park's only Wizards of the Coast contribution). Though I am a fan of the postmodern tendency towards self-awareness of the processes of fiction, the second section seemed to me a tad overindulgent, drawing so much attention to the narrator's writing process as to shove the remaining narrative elements into the background. In particular, I found myself more interested in the bizarre Manhattan-style project and the narrator's relationship with his family than the long digressions into the fictionality of fiction. Unfortunately, much like the previous section, this one doesn't offer any sense of closure, leaving much to be desired. The third narrative (the Nebula-nominated novell, "Ghosts Doing the Orange Dance") is also autobiographical in form, appearing to take place both in the future of the first narrative and during the period in which Park wrote A Princess of Roumania (2005). The cover copy identifies this third narrative as occurring in a near-future U.S., though this must be a remarkably subtle shift forward, as I failed to notice what identified the narrative's events as "in the future" (I may have forgotten, since each of Park's sections contain multiple intersecting narratives and time periods). Regardless, here, Park's marriage to the metanarrative and the seemingly deliberate memoirist focus settles around the history of Park's grandfather, Edwin, and an unsolved murder in the Park-McCullough House -- a real historical house from the 1860s, which I assume was once owned by Park's actual family; the narrator returns to the house on his journey through his family's history, unpacking some of the house's "secrets." The third section is less abstract than the second, in part because the metanarrative focuses on a multi-layered examination of Edwin Park's "real" writings (real in the fictional world, at least) in relation to the writing process of the narrator (presumably, Paul). Though this third section returns to the uprooting of reality present in the first narrative (as a form of closure, it seems), I must admit to being somewhat frustrated with the structure and direction. By the time I arrived at "Ghosts Doing the Orange Dance," I think I had gotten to the point where I wanted the ATVE to stop with its literary games and get to a "point" or "root" that would tie everything together. This became especially important to me because my own knowledge of the manipulated materials is inadequate, a problem which may not bother fans of Park's work. ATVE is primarily an alternative history with a heavy dose of what appears to be autobiographical material. Much of the shifts in history revolve around the Civil War, a period which I am woefully uneducated. While some of Park's shifts are obvious (aliens in the first narrative), the other shifts are less so, such that references to characters and moments were, for me, somewhat abstracted. This is made more difficult by the fact that many aspects of the novel seem to refer to Park's real life and his family, particularly in the second and third narratives, which focus on writing (with references to Park's work) and family (presumably Park's actual family members, or analogues thereof). The abstractness of the novel, in other words, became too overbearing for me. For me, it seemed as though the novel lacked a grounding element, something to tie the reader to a solid reality. A time period doesn't seem like enough to me, especially since the novel is split across three narratives set in what seem to be different versions of reality. I could tell that there was a purpose behind this narrative strategy, but what that purpose was never quite materialized as I read the novel. It may be that this is the kind of book that demands additional readings; certainly, one would be hard pressed to suggest this is traditional SF, as Park's style and delivery are far more in tune with the literary vein of the field than with the more public face of the genre. Abstraction is not necessarily a bad thing, however. ATVE's abstractness -- or my perception thereof -- or unrootedness, perhaps, needed to be facilitated by some sort of closure which would clearly tie things together so that an additional reading would not only seem immediately valuable, but also necessary. That closure, however, doesn't really exist for any of the individual narratives. I always got the feeling that Park felt compelled to stop in media res. It immediately made me think of Margaret Atood's Surfacing (1972), which has no discernible plot and engages postmodern metanarrativity in a less pronounced manner than ATVE. But that novel ends up "somewhere." That "somewhere" may be unexpected -- the main character has a mental breakdown which some have interpreted as a feminist social break from the patriarchal standards of society -- but it is still a "somewhere." Surfacing's plotless ending also leaves an opening, as what we learn about the main character's almost violent rejection of society doesn't close off the character's possible narratives; the novel's narrative, as the title might suggest, does end. But ATVE seems to lack this closure -- or, if such closure exists, it didn't read as such to me. In the end, I think my issue with ATVE is that I found it more frustrating than anything else. I recognize the strategies at play -- and even appreciate them -- but the destabilizing effect of the three vaguely-connected narratives continuously pulled me out of the reading process. I became too self-aware that I was reading a book which seemed determined to force me to think about the narrative process through an autobiographical funnel. But without either a grounding narrative (a plot, for example) or a ground frame of reference (a singular, clear "setting"), ATVE fell flat more often than not. Ambitious it may be -- as the cover copy enthusiastically declares -- but its success is questionable. Based on what I know about Park's other work, I suspect this will be a novel best appreciated by his dedicated readers. For me, it was a miss.